Daily Cultures believe adamantly that good gut health is the key to improving many health issues developed through poor diet and processed foods and were the first brand to launch dairy free probiotics into the everyday food and drink markets, with a unique formulation that enables their good bacteria to survive the acids in the stomach. With 80% of the world’s population having some form of lactose intolerance (source WHO) and Gut Health being projected as the big new wellness trend, Daily Cultures knew that now was the time to reinvigorate their brand! With a small range already in market, Design Activity were tasked to future-proof the current brand and packaging with a radical redesign. 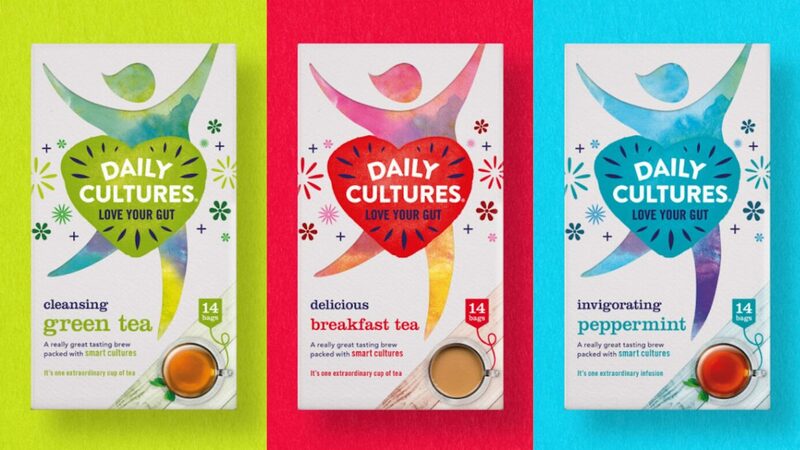 Daily Culture’s aim was to engage consumers with a brand that wasn’t like any other food and drink brand – a tasty product offering with health benefits that actually work. There were two key strategic challenges to creating the new brand identity and packaging design. Getting consumers to understand the unique benefits of non-dairy probiotics – having been misled over the years that probiotics work best in dairy products. Daily Cultures tea infact has smart cultures that are 10 times more effective than those found in dairy products! Striking the right balance between the serious undertone that Gut Health needs to have, versus appealing to consumers who recognise probiotics as a lifestyle choice for better health and wellbeing. The vibrant and distinctive new identity reflects the uplifting feeling you get when you’re at your happiest and healthiest. While the Love your Gut strapline provides instant acknowledgement as to the functional benefits of the range. The new Daily Cultures identity is open and approachable, communicating great tasting non-dairy food & drink packed with smart cultures to facilitate optimal gut health. Powerful stuff!